Stems: Erect, simple or branched above, nearly glabrous or stiff-hairy. Leaves: Alternate, short-stalked below, nearly sessile above, ovate to ovate-lanceolate, 1 to 6 inches long, to 3.5 inches wide, sparsely stiff-hairy; margins entire; tips tapering-pointed; stipules sheathing, tube-like; top margins fringed with short bristles. 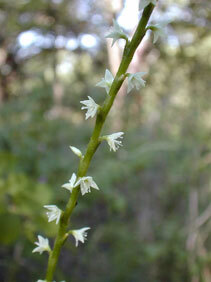 Inflorescences: Racemes, slender, spike-like, to 12 inches long, sparsely flowered, somewhat arching, terminal and in upper leaf axils. Flowers: 1-3 per cluster, spaced some distance apart, about 1/10 inch long; petals absent; perianth segments 4, petal-like, whitish to greenish, joined below; stamens 4; styles 2, extending beyond perianth edges. Fruits: Achenes, egg-shaped, shiny, brown. Habitat: Woods, thickets and stream banks. Uses: Native Americans treated whooping cough with a tea made from a mixture of Virginia knotweed leaves and the bark of the honey locust tree. Comments: Virginia knotweed forms clumps via rhizomes.